I’m still on a thin biscotti kick, so here’s another version for you. 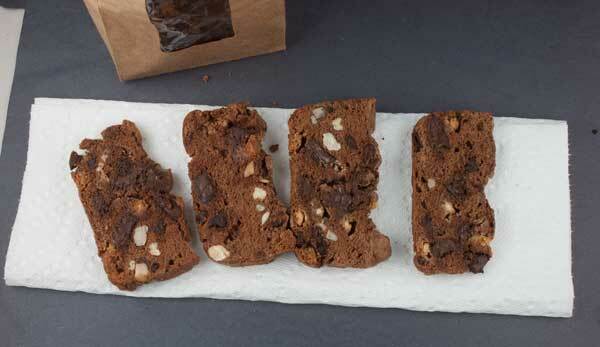 This thin biscotti recipe uses assorted nuts, white chips and chocolate chips. For the chocolate base, I just added 1 oz of melted unsweetened chocolate. Another change I made was to halve the recipe (the full batch is below) and use a slightly smaller loaf pan. The batter didn’t go all the way across the pan, but since it’s fairly stiff I just pushed it up against one side so that it covered about 2/3 of the pan lengthwise. I’m mentioning this because this batch looks a little nubbier than the last and the reason was the halving. Anyhow, it’s fun having all this biscotti around. Hopefully I won’t be tired of it by Christmas, because it makes a great gift. Preheat oven to 350 degrees F. Line a 9x5 inch loaf pan with strips of parchment paper or line with foil and spray foil with cooking spray. In a small custard cup, melt the chocolate in the microwave using 50% power and stirring every 30 seconds. In a metal or glass bowl, beat whites with a little of the salt until soft peaks form. Gradually beat in remaining salt and sugar; beat until stiff peaks form. Fold in melted chocolate and extract. Mix together the nuts and chips and fold them. The batter will be light brown, but the biscotti will be darker after they have gone through the whole baking cycle. Spoon the batter into your prepared loaf pan, spreading evenly. Bake on center rack for 35 minutes. Cool loaf in pan for about 20 minutes, then remove from pan and let it cool to room temperature. When it’s almost cool, transfer to the refrigerator and chill until very cold – this makes it easier to slice. Sorry I don't have an actual yield, but it varies depending on how thin the biscotti are.